How much does the form of a glass affect the taste of the wine inside? Did you know that glass is a naturally occurring substance? Did you know it’s most commonly made by lightning strikes on beaches or volcanic discharge? Now, I grew up in Michigan frequenting hundreds of beaches on every Great Lake for the last 45 years of my life. Hopefully my parents read this and can tell me that I found real beach glass, I always thought it was just broken bottles. I was reading an article by Kelli White on Guildsomm.com about the history of glass. As she suggested, I blew through the section of technical information and slowed myself down when it was about the history of glass vessels. Glass cups and vessels were first produced around the 17th and 16th centuries BCE in Ancient Egypt and Meso, and they belonged exclusively to the royal and the wealthy. Pretty crude devices by our standards, but they worked. When the blowpipe was introduced around 200 BCE by the Phoenicians, there was a big jump in quality. The blow pipe remains a critical part of glass making today. Skip way ahead to the 1950s when Claus Riedel started making wine glasses that were varietal-specific (i.e. for chardonnay, burgundy, etc). 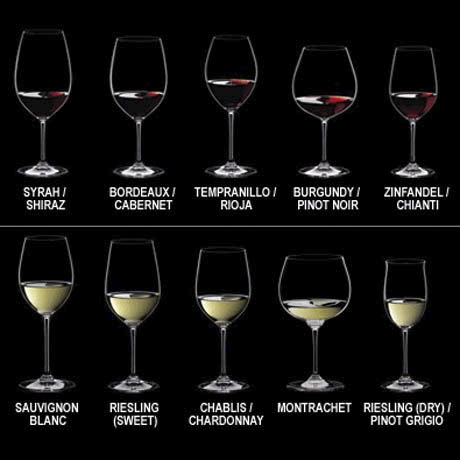 There are many Sommeliers that believe the size and shape of a glass affect a wine’s flavor. I can agree most of the time, but I honestly believe it isn’t that critical to the enjoyment. Plus, no wine professional seems to be able to explain exactly how the glass influences the wine. Some Sommeliers might cite the “tongue-map,” a bit of pseudoscience that seems to have stuck around (despite being debunked) that claims that different parts of the tongue are responsible for different types of taste (e.g. sweet, salty, sour, bitter). So, how might the shape of a wine glass affect the taste of the wine? The best answer I found lies in the fact that drinking wine involves both taste and smell. A lot of wine tasting involves the olfactory system, and the shape of a glass can determine how much of a wine’s volatile vapors reach your nose before tasting. See for yourself how much smell is a part of tasting wine: hold your nose while drinking, and you’ll notice your sense of taste is significantly dulled! From a professional tasting perspective, I use a cheap, thick-walled glass from Libby. Those beautiful thin walled crystal glasses break very easily. As an example, at Maynards we have a line in our budget that allows for glass breakage. We use Riedel (Restaurant Line) glasses, and last year alone we broke well into the triple digits of these glasses. Charlie Trotters (when he was alive and the restaurant was open) had a 40k per year budget for this. The reality is economies of scale. If I could afford $40 for a single glass that will break if you look at it the wrong way, then yeah, the Chardonnay would taste better. Just try not to let your mind play tricks on you. What really matters is what’s in the glass. Yellow Tail won’t taste any better in Riedel’s “Sommelier” line of glassware. Of course, this is just my opinion. Cheers! Light and fresh with a hint of sweetness. Great with cheeses, salads, chicken and lighter fare. Even better served really cold by itself on your porch! Dark fruit, leather, and chocolate leading to red currant, black cherry, and cigar box. This wine is just begging to be paired with red meat! Wine Club members, please come in and pick up your wines before they’re gone!